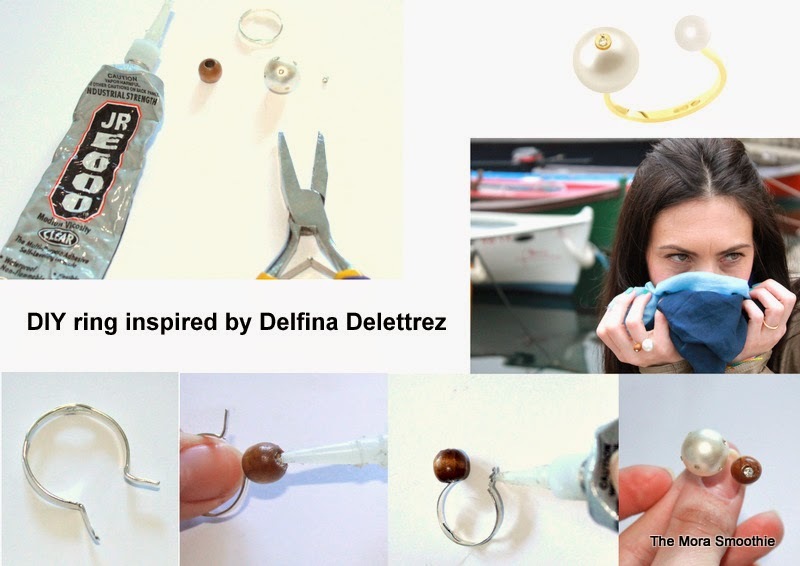 The Mora Smoothie fashion blog, DIY fashion by Paola Buonacara: Cool DIY ring inspired by Delfina Delettrez! Cool DIY ring inspired by Delfina Delettrez! Today a new DIY, the ring you saw here inspired by Delfina Delettrez. As soon as I saw it I fell in love and could not try to make a DIY and I wanna tell you that is very easy and fast, and the effect very cool, what do you think about? Essential: a large pearl (found here), ring base, glue, wooden pearl and a swarovski. Tutorial: helping with pliers I bent the end of the ring, then I applied a bit of glue and I put on the one side the large pearl and on the other the one in wood and with the glue to cover the hole a swarovski. The ring is ready to be worn, it's amazing, isn't it? A big kiss and soon. Oggi un nuovo DIY, l'anello che avete visto qui ispirato a Delfina Delettrez. Appena l'ho visto me ne sono innamorata e non potevo che cercare di fare un DIY e vi dirò è molto semplice e veloce, e l'effetto molto carino, voi cosa ne pensate? Necessario: Perla grande (la trovate qui), base anello, colla, perla in legno ed uno swarovski. Tutorial: aiutandomi con delle pinze ho piegato i finali dell'anello, poi ho applicato un pò di colla ed ho inserito da una parte la perla grande e dall'altra la perla in legno ed incollato sul buco lo swarovski. L'anello è pronto per essere indossato, non è bellissimo? Un bacione e a prestissimo. So Funny by Stroili, colorful art! Cool DIY ring with fringes! Gabrieleffe by Gabriele Fiorucci! Stay Cool! Summer Star Capsule Collection Le Pandorine! Wave riding... with the Reef shoes! Spring outfit with my DIY! Driving in Tuscany the new GLA by Mercedes-Benz!